The lot of a reptile captured or bred for the pet-store trade is grim. The trip from the breeder or dealer is typically cramped and unsanitary, and many reptiles do not survive it. Those who do will probably have health problems that don't show up until months later. Unfortunately, reptiles are perceived as requiring minimal care rather than specialized care, so they're big business—nearly 4 million U.S. households owned a reptile in 2000. Pet-store employees are rarely trained to effectively tend to the sensitive needs of reptiles and therefore cannot educate prospective reptile caretakers. Depending on the variety, snakes can live for decades and grow to lengths in excess of 5 feet. They require at least a 30-gallon tank, frequent checkups, and care by a veterinarian who specializes in reptiles. Fresh water and a spotless environment must be provided at all times. Most are carnivorous. They are susceptible to a variety of parasites as well as blister disease, respiratory and digestive disorders, and mouth rot. Strictly controlled daytime and nighttime temperatures and the careful application of pesticides are required in order to guard against mite infestations. Green iguanas are some of the most frequently abandoned companion animals, likely because people find out too late what is required to care for them. 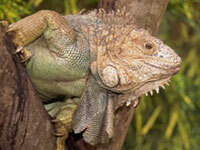 A properly cared-for iguana can live for more than 20 years and grow to be more than 6 feet long. The enclosure for a full-grown iguana should be at least 18 feet long, humidified, and maintained at a particular temperature with specific timetables for darkness and ultraviolet light. Common problems for captive iguanas are metabolic bone disease from calcium deficiency, mouth rot, respiratory disease, abscesses, and ulcers. Wild iguanas do not suffer from any of these illnesses. They're also strict vegans, limited to a very specific range of greens and fruits. Costs for food, an enclosure, lighting, and vet bills can total hundreds of dollars per year. It takes about a year of daily interaction to socialize an iguana, and even then, sexually mature males will be very aggressive six months out of the year if they see their own reflections or if confronted with other iguanas. People who would never take on the commitment of a 6-foot iguana might be interested in geckos. Sadly, these are very popular reptiles in pet stores. These small, frail-looking lizards can often live up to 30 years and require a very particular environment without the slightest variance in temperature. They feed on insects and baby mice. Although wild geckos are found throughout temperate and tropical regions of the world, most of the ones offered for sale are captive-bred. In contrast, most of the North American species of turtles available in pet stores have been taken from their natural habitats. All other species are probably captive bred—most likely in Louisiana, which has nearly 60 "farms" that exported 11 million turtles in 2000. Most states have laws either banning or restricting the sale of turtles, so it is likely that any you see at a pet store have suffered illegal capture or were raised in less-than-humane conditions. Since parasites, bacteria, and fungi prey on weak or stressed turtles, the health of a store-bought turtle is questionable. Just like any other reptile, a turtle's needs are very specific: thermostatically controlled temperatures, enough water to swim in, a large housing area, and a varied diet. The average lifespan of an aquatic turtle is 25 years, while a land tortoise could outlive you. There is a health risk associated with owning any reptile. Seventy thousand people in the U.S. contract salmonellosis from direct or indirect contact with reptiles and amphibians every year. Children, pregnant women, and people with compromised immune systems are particularly at risk of serious illness or death. If you or anyone close to you is in one of these categories, rethink bringing a reptile into your home—even healthy-looking animals may be carrying the disease. Many reptiles are brought into the country with little or no inspection or quarantine. Welcoming a reptile into your home means a commitment of time, space, and money. You'll need to provide the right temperature and humidity and specific light/dark cycles that may not coincide with your own or be convenient to you. Backup power is necessary to keep a constant temperature in the event of a power failure. It is a harsh fact that most reptiles are carnivores—do you really want your freezer full of dead animals? In all, costs for food, an enclosure, lighting, and vet bills can total hundreds of dollars per year. Purchasing a reptile caught in his or her natural habitat encourages the removal of wildlife from delicate ecosystems. Buying captive-bred animals only encourages breeders to replenish their stock. If you must have a reptile as a companion animal, please consider adopting one from a local shelter or rescue group.